Can you remember when you were a child and experimented with a magnifying glass, focusing the sun’s rays on a piece of paper and watching it slowly begin to burn? Even though the focal point was extremely hot, if you placed your finger between the glass and the paper you didn’t experience any discomfort. Well, it turns out there’s a similar phenomenon with sound waves, known as high intensity focused ultrasound or HIFU, that has been used in medical treatment for over sixty years. Treating a patient with HIFU. Copyright Theraclion. The inventor of the EchoPulse robot is François Lacoste, the company’s Chief Scientific Officer, who was recently awarded a United States patent (US 8,353,832). 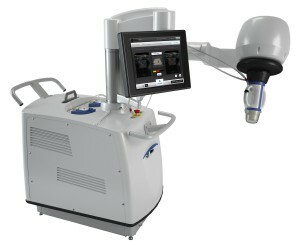 At the system’s core is a visualization and treatment unit that includes: an ultrasound transducer for real-time imaging of the target area; a HIFU emission device for treatment of the tumour; an articulated arm for easy positioning on the treatment area; and a motorized controller to perform precise positioning of the treatment head. The EchoPulse surgical robot. Copyright Theraclion. In addition, there is a disposable EPack that circulates fluid, ensuring both cooling of the treatment head and coupling of the visualization probe, thus providing optimal image quality. The patient lies on her side on the treatment bed while the surgeon — normally a gynaecologist — uses a touch screen to image the tumour in 3D, control the robot and ablate the lesion in a step-wise fashion. The focal point reaches a temperature of 85 degrees Celsius, hot enough to kill the tumour cells, and the operation takes no more than 40 minutes. The patient, who requires no anaesthesia and is mildly sedated, experiences no pain or skin damage and is discharged by the afternoon of the procedure. So, with this ingenious device, ultrasound is used both to visualize and to treat the lesion. Now that’s rather nifty!